Drinking in Thailand is typically a lighthearted occasion filled with laughter, food, and friendly gestures. Unsurprisingly, Thai beer pairs very well with spicy dishes and tropical humidity; local rum is celebrated by Thai people and budget travelers who appreciate the price. Drinking sessions in Thailand are certainly sanuk (fun), but they often go late—be prepared and know how to survive! Rather than ordering individual cocktails, groups of Thais often prefer to order a bottle of spirits to share. A bucket of ice and a few optional mixers are then ordered and put on the table. Popular mixers are carbonated water and Coke or Sprite. Staff will replace the bucket of ice several times as it melts throughout the evening. Ice is even added to glasses of beer to combat hot, sticky weather. Tip: Putting ice into everyone’s glass when first getting started is a very polite gesture. By drinking communally, each person can control the potency and taste of their self-mixed cocktails, therefore avoiding any potential loss-of-face scenarios. Drinking etiquette in Thailand is much less rigid than that in China or Japan, but some rules of status and “giving face” do apply. Pouring a drink for someone else is a nice gesture; top off the glasses of people around you if you fill your own. Chances are if someone at the table doesn’t get to it, the bar or restaurant staff will continue to top off your drink each time it drops below halfway—don’t drain your glass unless you want a refill! If you find yourself the guest of honor, you’ll probably be expected to sit at the middle of the table rather than at the head. The guest of honor is also usually expected to give a toast at some point. Toasts are often given throughout a drinking session, not just at the start. When clinking glasses with someone, take age and status into consideration. If someone is your senior or of higher status, hold your glass slightly lower and clink low on theirs. The easiest toast and way to say “cheers” in Thai is simply to raise your glass (but not too high) and offer a smiling chone gaow (touch glasses). Chone gaow (touch glasses): When someone wants to propose a toast, they’ll sometimes simply shout chone! so that all at a table will raise a glass. In 2006, the legal drinking age in Thailand was increased from 18 to 20 years old. Bars rarely, if ever, check IDs for tourists. Druggings do happen in Thailand, particularly with bucket drinks. Be careful about taking drinks from strangers or leaving a drink unattended on the table. The staff in “girlie” bars have been known to drug and rob Western men. Unless posted (the moat around the Old City in Chiang Mai is one notable exception), you can legally carry an open drink on the street in most places throughout Thailand. Glass beer bottles have a small deposit refund in Thailand, prompting people to go around gathering them for recycling. When finished, leave your bottle at the bar or place it next to a rubbish bin where someone interested can find it. Singha: Thailand’s oldest beer is pronounced as “Sing”—the name is derived from the Sanskrit word for lion. With a standard ABV of 5%, Singha is usually the priciest local beer choice. Leo: It’s no coincidence that the maker of Singha, Thailand’s “lion” beer, also makes a beer named Leo. Leo is a cheaper lager from the same brewery and has an ABV of 5%. Chang: The go-to beer for backpackers in Thailand, Chang is usually a bit cheaper and has a little more bite—both in alcohol and taste—than its competition. Chang Classic, the original lager with an ABV of 6.4%, was once rumored to have quality control issues. Chang (pronounced: “Chahng”) means elephant in Thai, prompting backpackers to fear the dreaded “Changover” that feels like an elephant standing on one’s head. The popularity of Chang Classic is followed up by Chang Export (ABV 5%), Chang Draught (ABV 5%), and Chang Light (ABV 4.2%). Plenty of other beers are either brewed or readily available in Thailand, most notably Heineken, Carlsberg, San Miguel, and Tiger. Beer is often drunken with ice. Thai buckets began as a way for backpackers to carry around a lot of alcohol during island parties such as the Full Moon Party, but they are now celebrated throughout Southeast Asia. You’ll find those colorful, plastic sand buckets filled with booze and a handful of straws (presumably for sharing) from Vang Vieng in Laos to the Perhentian Islands in Malaysia. Plastic bucket drinks can pretty much be found anywhere along the Banana Pancake Trail where backpackers like to party. The idea behind bucket drinks is sound: a table of travelers can share one, everyone taking a straw, and socializing comes easily—particularly as the heart-revving local Redbull starts to work its magic. With a large volume of alcohol masked by sweet mixers and caffeine, many travelers have found out the hard way that buckets are supposed to be shared rather than consumed singlehandedly. The original Thai Bucket drink consisted of an entire small bottle (300 ml) of Sangsom or some other local rum, Thai Redbull, and Coke. Now, bucket drinks are available with any combination of spirits and mixers. In places such as Khao San Road in Bangkok, prices for buckets keep getting cheaper—sometimes US $5 or less! Inevitably, these deals that seem too good to be true actually are; the buckets often turn out to be more sugar and caffeine than alcohol. Redbull originated in Thailand; the local stuff sold in small, glass bottles is rumored to be stronger and more effective than the Redbull sold from cans in the West. Thai Redbull does contain a different formula, has more caffeine content, and has a sweeter taste. Unlike Redbull sold in Western countries, Thai Redbull isn’t carbonated. Without the carbonation, those compact, glass bottles of Redbull are incredibly easy to down in one gulp—but be mindful of how much you consume! Shark and M150 are competing energy drinks that are sometimes substituted for Redbull. The local spirit of choice is Sangsom, a popular rum, with an ABV of 40%. Although Sangsom is often referred to as a whiskey, it’s brewed from sugarcane and aged in oak barrels, categorizing it as a rum. Hong Thong and Mekhong are two other popular brown spirits that are cheaper offerings from Thai Beverage, the makers of Sangsom. Pretty much every place in Asia has a cheap, local whiskey made from fermenting rice—and Thailand’s is infamous. Popular with villagers and anyone else who appreciates a cheap drink, lao khao is made from fermented sticky rice. Potency varies depending on whoever made it. Commercially bottled varieties are available, but many villages concoct their own brews. Locals often enjoy watching a farang (foreigner) struggle to handle a shot of lao khao! With one of the highest drinking-and-driving problems in the world, Thailand is putting increasing pressure on alcohol sales and accountability throughout the country. Individual provinces such as Chiang Mai have stepped up restrictions on top of national requirements. In 2006, the legal drinking age was increased to 20 years old, one of the strictest in the region. 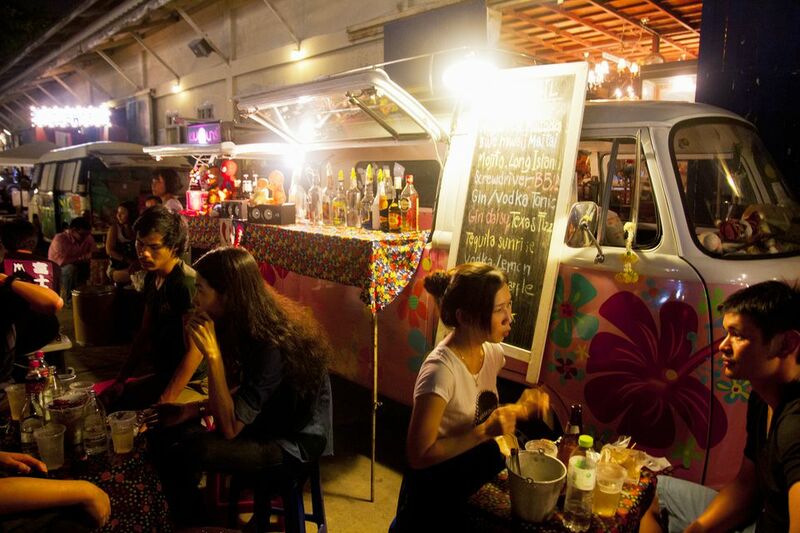 Bar closing times are set at midnight in many places throughout Thailand, although enforcement often depends upon the whim of the bar and if any “fines” are paid over to the local police that night. Minimarts such as 7-Eleven are only allowed to sell alcohol legally from 11 a.m. to 2 p.m. and then from 5 p.m. until midnight. Corporate minimarts and grocery stores closely adhere to these official hours, however, independently owned shops and vendors usually continue to quietly sell alcohol. Alcohol sales are prohibited during provincial and national elections, Buddhist holidays, and certain public holidays such as the King’s Birthday. During these times, only a brave few bars and restaurants will be selling alcohol. Many Buddhist holidays occur throughout the year, often coinciding with full moons, prompting dates for the Full Moon Party in Koh Phangan to be changed by a day or two. You won’t find wine for sale in many places outside of liquor stores in big cities and mega-sized supermarkets that often cater to Western expats. Large supermarket chains such as Tops, Rimping, and Big C often have the largest selection of imported wines. Thailand has three thriving wine regions that are slowly gaining international acceptance. The Siam Winery is located about an hour south of Bangkok and is famous for floating vineyards on the delta of the Chao Phraya River. Tours are available at vineyards in the Khao Yai National Park, and a wine scene is developing in the northeast corner of Thailand near the border with Laos.